Why Do People Live in Grant Park? 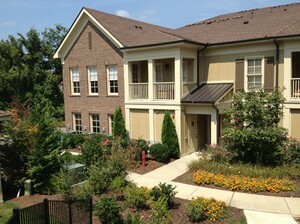 Grant Park (aka Residences of Grant Park) is located just west of Interstate 65 off McEwan Drive in Franklin TN. It is positioned in the heart of the Cool Springs retail district; just minutes to commercial offices, retail and dining. 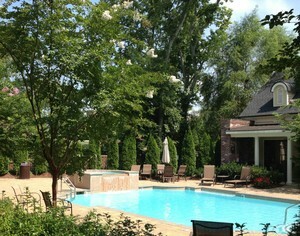 This is an ideal location for those working in the Cool Springs area or commuting to Nashville. The easy commute and upscale amenities make this development highly desirable for those looking for low-maintenance townhome living in Franklin TN. What is the Grant Park Neighborhood Like? There are 51 residences in Grant Park ranging from a one-bedroom, one bath, 930 square foot townhome to a 1,783 square foot, two bedroom, two bath. Every residence has a front porch, gourmet kitchen, open living area and a direct-access garage. The professionally maintained grounds offer you the freedom of no-maintenance living, all within a gated community. Amenities include a resort-style saline pool, fitness center and clubhouse. What Type of Activities are Offered Near Grant Park? Being located in the heart of Cool Springs has its perks. You are just minutes from the Cool Springs Galleria. There are a wide variety of shopping and eating venues offering something for every palette. Historic Franklin is just a short drive where you will find lots of shopping, eateries and entertainment venues, including the Franklin Theatre which offers movies, live theatrical performances and music groups. What Schools Will Grant Park Students Attend? Grant Park townhomes for sale in Franklin TN is served by Franklin Special School District (FSSD) for elementary and middle school and Williamson County Schools for high school. Children attend Johnson Elementary, Freedom Middle School and Centennial High School. Let Us Help You Find Your Grant Park Home. For further assistance finding a Grant Park townhome for sale in Franklin TN, contact Tammie White today at (615) 495-0752.